Sometimes when I write posts for the blog, I write so fast that my mind can barely keep up with my fingers. (Hence the occasional frequent typo.) Ideas fly into my head and I literally have to jump up from my chair and make them. 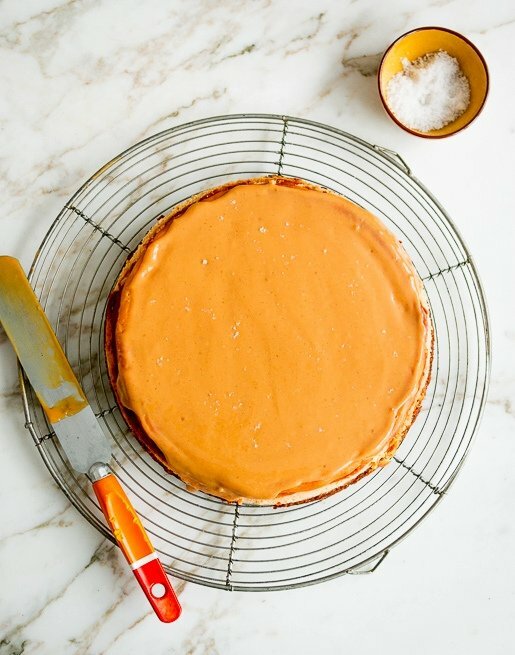 Such was the case with this Dulce de Leche Cheesecake recipe, which combines two of everybody’s favorite things: cream cheese and dulce de leche. The French are fans of le Philadelphia, a catch-all word for cream cheese (just like we say Band-Aids and Kleenex, which are actually specific trademarks) and they are also fans of confiture de lait (milk jam), their own version of dulce de leche. They don’t, however, have graham crackers, an all-American invention made with whole-wheat flour, and designed by Reverend Sylvester Graham, to discourage people (his followers were called “Grahamites”) from having impure thoughts. Impure thoughts have their place in baking and cheesecake is probably the base of many of them. My thoughts were close to prurient when I was pulling the ingredients from my cabinets and refrigerator. So I guess I should be glad that we don’t have graham crackers in France, not just because I like to make cheesecake from time-to-time, but because it gave me the chance to make my own. (From the recipe in Ready for Dessert.) But store-bought ones are fine to use as well, in case you have more modest goals. Like graham crackers, you can also buy dulce de leche. But because idle hands are the devil’s workshop – and my hands work faster than my head (where ostensibly, I could reason that it’s not vital to make every part of the recipe from scratch) – I went ahead and made my own. Europeans like cheesecake as much as Americans (I did a bit of reading around, and while I thought it was of Eastern European origin, it seems it may have been invented in Greece), and we each share a love of dulce de leche, or confiture du lait, although I’ve not seen the two combined in any Parisian pastry shops. However they may want to rethink that because my dulce de leche cheesecake was a huge hit here, with some French friends – and even some neighbors, including one who stopped by to drop off some magazines and ended up going home with a large chunk of gâteau au fromage. Gluttony may be a sin, but sharing is divine. 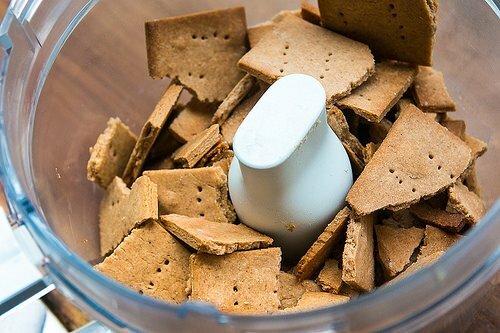 In Europe, you can use speculos spice cookies for the crust, which are a little heavier than graham crackers, but will work just about the same way. You might want to decrease the melted butter in the crust by 1 or 2 tablespoons and omit the sugar, to compensate. 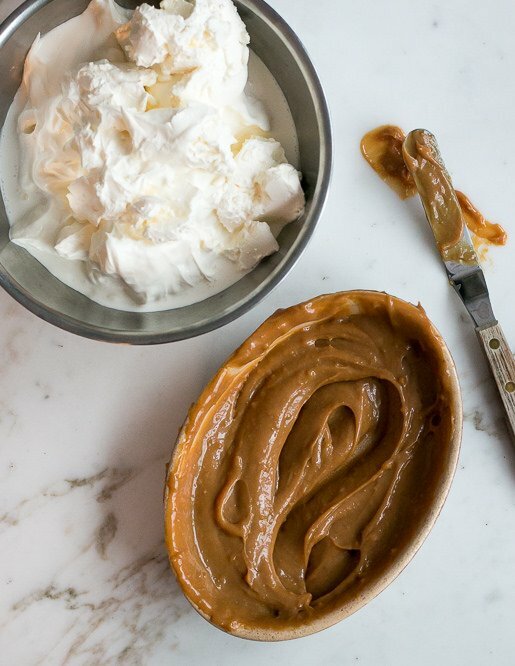 If you use my dulce de leche recipe, be sure to double it as you’ll need more than one cup. 3. Bake the crust until it’s light brown, 10 to 12 minutes. Remove from oven. 4. In the bowl of a stand mixer fitted with the paddle attachment (or by hand, or in a food processor), beat the cream cheese and sugar until smooth. Add the eggs one at a time, stopping the mixer between each addition to scrape down the sides of the bowl. Mix in the 1 cup of dulce de leche, vanilla, and salt. Scrape the batter into the prepared pan and bake for about 55 minutes, until the cheesecake appears to be just set in the center. If you jiggle the pan, the outer part of the cake should not move but a small circle in the middle, about the side of a bracelet, should still quiver. 5. Remove the cheesecake from the oven. Set on a cooling rack. Run a knife around the outside of the cake to loosen it from the pan, then let the cheesecake cool completely. 6. When the cake has cooled to room temperature, warm the dulce de leche and cream or milk is a small saucepan over very low heat, stirring until smooth. Remove the outside of the springform pan from around the cake. 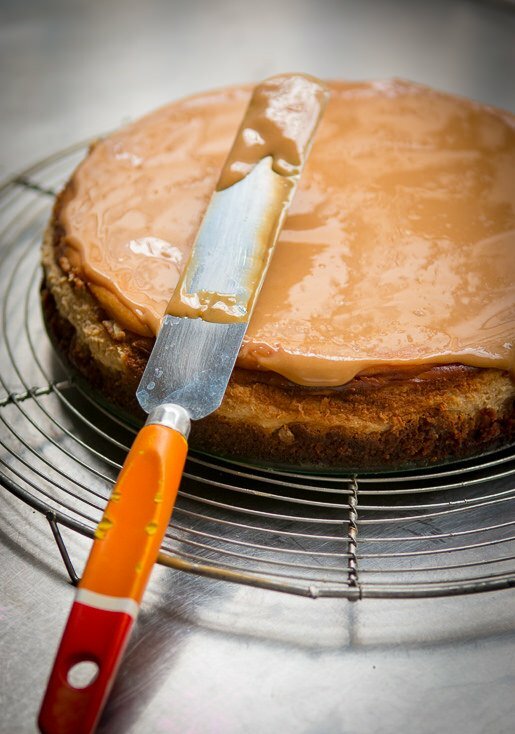 Spread the dulce de leche topping over the cheesecake, pushing it right to the edge of the cake. Just before serving, sprinkle the cake with flaky sea salt, just enough so that everyone gets a flake or two in each bite. Storage: The cheesecake can be made up to four days ahead, glazed, and refrigerated. The unglazed cheesecake can also be frozen, if well wrapped, for up to two months. and of course, you can make the base with Speculoos, without needing to add sugar. David, if a cup is 280g 2/3 of it can’t be 95g. It’s either ⅓ cup or 190g. Dear writer, dulce de leche is an invention from Argentina, where also is made the best dulce de leche you can taste. Good lord, your blog really does get the most persnickety people, doesn’t it? Anyway, 1/3 or 2/3 of a cup be damned, this looks amazing. And I appreciate the historical lesson about the origins of the Graham cracker! Never knew it was meant as the dietary version of the chastity belt. Dave………… Please pardon my ignorance but dulce de leche is condensed milk ?? And Graham cracker crust is such a wonderful thing. A divine dessert altogether even to an ex-Philadelphian. In Argentina we may have tons of dulce de leche, but there are no Graham crackers, so I had to learn to make my own! I love that you included a touch of cinnamon to the crust. Next time I make a batch of crackers I will double the recipe to save some for this absolutely “sinful” cheesecake! Viviana, you should use Lincoln. They have kind of the same flavor and texture. Saludos. Laura, have you tried the cheescake with the Lincon”s? I did the crust myself, but if the Lincoln’s work, it is really a great point. This looks so good – it’s going on the list! I make dulce de leche all the time when our milk cow is in full production because its a great way to take 4 cups of milk and turn it into a more storage friendly 1 cup :) And I always call it “milk jam” too. Thanks for the yummy recipe! this takes me back to when i lived in argentina and would sneak into my host family’s fridge with a spoon, digging into the pot of dulce de leche while they slept during siesta. now i definitely need to make this so i can sneak off slivers of cheesecake from my fridge. Uh oh, watch out for people “accidentally getting your mail” just for an excuse to come by for free cheesecake! Ohhhh this looks so good! I love speculos cookies but it never occured to me to use them for the crust! Will be making this soon. Lovely photos! Well this looks super…can’t wait to try it. I’ve also used Speculaas cookies as a cheesecake base for the 25+ years I’ve lived in the Netherlands. Once in a while I’ll use some digestives, which really do taste the same as graham crackers for the crust. I’ve even used the chocolate covered digestives, for cheesecake and for S’Mores…built in chocolate! pot with one heck of a lot of stirring. Here in Spain we have l kilo tins of condensed milk that are very inexpensive. thing happening on your ceiling. If one is more concervative, you may use smaller cans, or Davids very good recipe. Juan Carlos + Debbie: I haven’t had digestives in years, but thanks for chiming in that they’ll work in place of the graham crackers, too. ron: I linked to my recipe in the post for dulce de leche, so you can see how it’s made. It’s milk that’s cooked until caramelized. Yum! Hi David! I live in Germany and (obviously) I can’t find graham crackers. Can I substitute them with digestive biscuits? Or something else? Thank you! Spekulos and LU’s The cookies (or I guess they call them biscuits) are the closest I have found to graham crackers here in France. I made two cheesecakes (one praline, one citron for two different parties) for my husband this week in honor of his birthday and used both cookies for the crusts. Have made NY cheesecake with ddl swirled on the plate and it was outrageous – topping it is much better…great idea. This is amazing! Sablés are the solution to an unbaked cheesecake base in France, David. Available in most good French supermarkets, they can be plain (as in no chocolate covering), milk chocolate covered or plain chocolate covered. They’ve certainly stopped me importing McVitie’s digestive biscuits from England just to make cheesecake bases! This looks amazing David! A perfect cheesecake with a gorgeous topping. Love the simplicity of this! PS. I know this is a graham cracker comment but the re was not one for the Lechi ..and hey I am old!! WOW! This sounds absolutely divine! Though I’m not in Europe, I am tempted to try using Specaloos (Trader Joe’s version) in place of graham crackers for my next cheesecake. Thanks for the tip! Yum!!! i need a good dessert for the Super Bowl party I’m hosting. This looks incredible. Can’t wait to try this recipe! Dulce de leche is the MSG of desserts. Dear David-may I please have your address? I have some magazines I would like to drop off. Just kidding-sort of. Hey David, maybe I am “nulle” but I can’t find the home made Graham Cracker recipe in Ready for Dessert. What page is it on? I’m in the Tarn et Garonne in a small medieval village and would love to wow my friends with this fabulous cheesecake. As others have said, digestive biscuits are what we use here in the UK for a biscuit crumb base, but what I like even better is a ginger biscuit (ginger nut) base. Yum! And you can buy tins of dulce de leche if you don’t want, or haven’t time, to make your own (I am one who boils up tins of condensed milk for hours to make it, and this is certainly a great timesaver). Then again after eating this it just might be. I was on the hunt for a cheesecake to make this weekend and I thank you for the timely recipe. I guess great minds think alike. I do try to work chocolate into almost anything so it just might find it’s way into the crust. 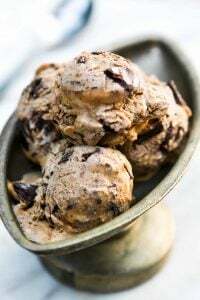 I started reading this recipe and thought – what a great idea to top with Dulce de Leche… but as I read it further – you’ve added a cup to the batter – wonderful! I continue on …I am reading the directions – the sea salt on top!!! VIOLA – that is the crème de la crème. Fantastic!! I cannot wait to make this…Thank you!! In Australia we cannot get Graham Crackers but can get McVitties, thank you to Juan also thank you to Pascal as I wouldn’t have picked up the weight disparity. Personally I prefer weighing ingredients as I find it more accurate, this is why I love your site (along with the yummy recipes) as in Australia we mostly go by weight, saves me so much time not having to convert from American cups to metric. 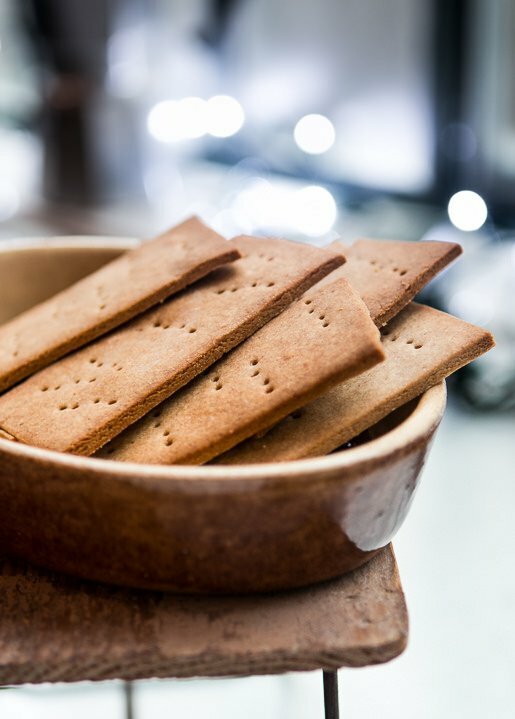 @Angela: I have been using Vollkorn Leibniz Butterkeks as substitute for graham crackers – works very well. Sometimes I add a tiny amount of cinnamon to the crumbs. Btw, it’s very easy, and energy-efficient, to make Dulce de Leche in a pressure cooker. Put the (unopened) cans of sweetened condensed milk in the steaming insert, add about a cup of water to the pot and cook at High Pressure for about 45 min. Take the pot off the burner and let the pressure release by itself. Important: only open the cans when they have cooled down. Or you can pour the sweetened condensed milk in a glass jam jar (I use Bonne Maman), cover it loosely with foil (no lid) and pressure cook in the way described above. Showing my age here but, on washing day my mother used to throw a can of condensed milk into the copper with the clothes (unopened of course). That night we would have delicious dulce de leche – though we just called it caramel. Yum! Just when I thought I might give up cheese……..not gonna happen now. This looks fantastic! When I was doing research on bonobos in the Congo, we always carried little tins of dulce de leche in our backpacks since we never knew when we were going to get back to camp. It was easy enough to boil up big batches over the fire that was always going. Unfortunately, they were joined by another very portable food – sardines – not a happy pairing! It’s been long enough now that I think I can eat dulce de leche again and the idea of topping cheesecake with it sounds wonderful. This cheesecake is absolutely beautiful and sounds so indulgent. I can only imagine how incredible this flavor combination must be. This is the perfect Valentines Day dessert. It is gorgeous and looks so special. Oh GREAT!!! You just HAD to do this, didn’t you?!!! A dulce de leche cheesecake?!! and here we are in the middle of the frozen tundra that is NY state and unable to exercise anything more than our fingers….lol! I need this cake like I need another 10 lbs! But what the heck….it looks divine!! You’re killing me!!! Love to bring to a Super Bowl party! Can I make in cupcake pan with liners? How long would I bake? Thx! When I was in college we used to go to Sylvester’s, a restaurant in Reverend Graham’s former home, for brunch – decadent and rich and I’m sure he would have disapproved! It’s still open as far as I know, in Northampton, MA. Do you think bonne maman’s milk maman will work in this recipe? We can get it quite easily here in Singapore. Thanks for the lovely recipe. cheesecake looks spectacular. it’s on the “to do” list for sure. i was intrigued about making the graham crackers and looked in “ready for dessert” for the recipe as you mentioned, but can’t find it. it’s not in the index. maybe buried in one of the recipes in the book? please pass info on on how to find it when you can. thanks. here in Brazil, we don’t have graham crackers too, I use biscoito maizena and it turns out perfectly. Cheese cake is not very common here, but when we do it we like to top it with goiabada (guava jelly). re the graham cracker recipe in “ready for dessert”….. i think that i found it in the lime-marshmallow pie recipe. is that the right one? thanks. Thank for recipe, I have made your dulce de leche by baking in a Bain Marie / delicious.Are you saying that it is essential to use Philadelphia cheese or can I use a full cream cream cheese? Sometimes I find Philadelphia salty. Nancy H: That’s an unconventional combination indeed! Denise: You can use any full-fat cream cheese to make this cheesecake. Fei: I’m not familiar with that product but I looked it up online and it says it’s “confiture de lait” so I’m pretty sure it’d work. AnneMPLS: I’ve not baked there in cupcake tins but they may be hard to remove. It might be messy with cupcake liners, but I can’t really say without trying it. If you do, please let us know how they turn out. Wouldn’t a 180C oven cause the cheesecake mixture to curdle even in a bain-marie? I have a convection oven and couldn’t get away with baking such a cake in a water bath above 150C. The baking method that you recommend in The Sweet Life (i.e. 260C for 12 mins followed by 100C for 40mins in a bain-marie) is something I have not tried yet. Which would you say gives better results (i.e. a smoother final result)? Also, I don’t mean to be a party pooper, but I find Dulche de Leche to be insipid, especially the store bought stuff, or anything made with sweetened condensed milk. I recently got a jar of Fauchon’s Confiture de Lait Praline and I found that it is no better than the Argentine store bought brands. 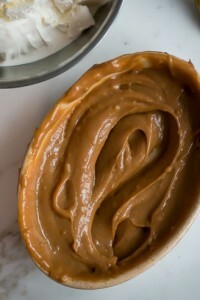 I would much prefer to substitute all the Dulche de Leche in this recipe with a ruddy home-made caramel – only trouble being is that it is sweeter thus necessitating reducing the amount of sugar in the batter by some 20-30g. I would rather forego all those Maillard flavours and end up with a far more “refined” end-result (I hesitantly use quotation marks since I am sure many may beg to differ ;-)). Although I live in Argentina, where I can by very good quality of Dulce de leche, I love to do it myself. What if I cannot find the Graham Crackers? If you read the comments, readers in other countries were kind enough to offer suggestions on what to use in place of the graham crackers. 1. Scroll through them, to see if any of the substitutions are available where you are. 2. Do a Google search, using the search terms “Graham crack recipe” and one should show up. 3. If so, bake them as directed by the recipe, then crumble them up and use those. @Angela – I’m also in Germany, and I like using ‘Hobbits Kekse’ for a cheesecake crust + some cinnamon! Oh the filling tasted so good (just put the beauty in the oven) I couldn’t share the spoon licking part. Made the crust from remaining Christmas cookies, I am not yet sure if I need the glaze, guess I’ll feel a strongly sinfull if I do put it on.. can’t wait for dessert tomorrow he he; thank you for the beautiful recipes and your great site in general! I do like this standard cheesecake recipe, rather than the ones with sour cream, etc.,. Dulce de Leche is my childhood favorite from Argentina, whenever my grandmother would come… can still picture the cans coming out of her suitcase. I have been less than happy with the outcome when I have attempted to make it. My best attempt has actually been in the slow cooker, milk sugar and baking soda. In Buenos Aires, the bakeries are filled with little pastries stuffed with dulce de leche. I can eat them by the dozen. I think I will try this soon…. Like previous commenters mentioned, McVities Digestives are the Irish & UK ‘go-to’ for any cheesecake base. My daughter is addicted to Speculoos so she comes home twice a year from her student exchange family with loads, & brings McVities over which they’re equally addicted to! Just to digress here – I followed some threads in this & found your chocolate brownie + Altoids recipe (from 2008!) which I’m definitely going to try now. The alternative to Altoids are Silvermints – made in Ireland since the 1920s…3 pkts for €1 means very affordable to order online! Nous sommes entrain de deguster votre” Dulce de leche” cheese cake devant la television en regardant le SUPER BOWL !!!! Je suis fiere de moi! ca a ete une reussite . Merci David pour la recette. I know what I am making for Valentine’s Day. Thank you for this recipe and the historical info on graham crackers. I had no idea! David, sorry as I know this recipe has incited lots of excited responses, but I do have a question. 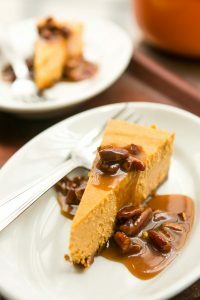 I went through all the comments on this and the dulce de leche page to find out if you’d indicated whether your recipe could be doubled, as it needs to be for this cheesecake, but in 2010 you wrote you hadn’t tried doubling it. Did you try doubling it when you made this? Or does it have to be made in two separate plates to get the 1-2/3 cups you need? Thanks so much as I’m anxious to make this for a big gathering on March 1st. Oh, oh. 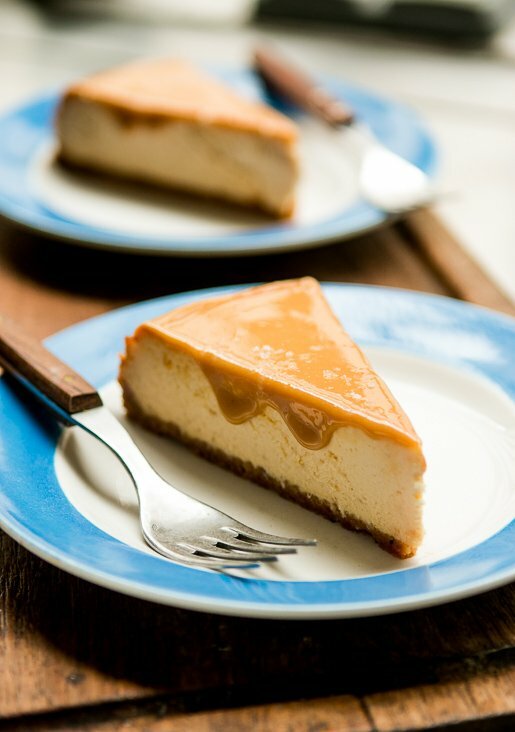 Dulce de leche meets cheesecake: yes please! It looks deelicious!! In Australia, Arnott’s digestive biscuits work just fine for a cheesecake base. Have been using them for decades. It’s in the oven! So far, my lifelong history of cheesecake success is 0%. But my livelong history of David L success is 100% So we will see. I am quite hopeful. It was the best cheesecake that I or my guests had ever eaten! Super delissima! This looks amazing… impure thoughts and all! Hmmm… and now I am thinking goat’s milk cajeta with a good fresh goat cheese instead of Philadelphia. I forwarded this post to a friend in San Francisco who bakes, and he turned around and made if for a birthday dinner this weekend. It was a big hit. Thanks! Looking forward to making this for my grandson, who LOVES cheesecake and Dulce de Leche. However, I’m interested in only putting the Leche on the top…how is the cheesecake recipe affected if I leave out the one cup? 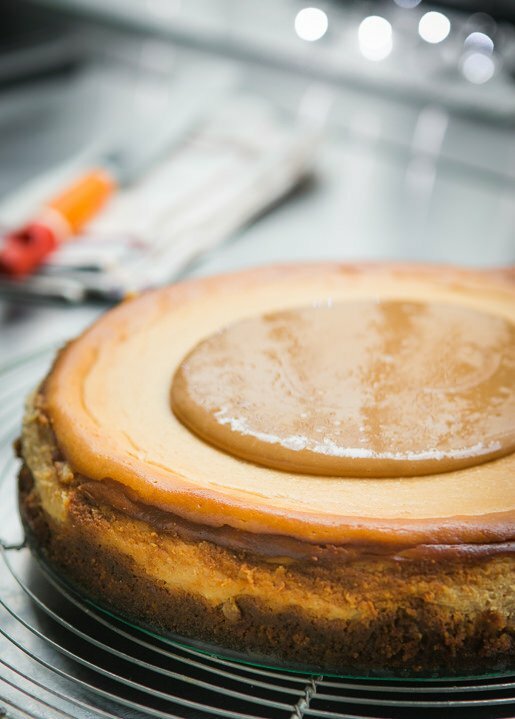 I’ve not made it without the dulce de leche in the cheesecake but if you want to try it, you may try substituting sour cream for the dulce de leche. But without trying it, I can’t say with 100% certainty. If you do try it, let us know how it works out. I make cheesecakes often and I looove dolce de leche, so combining these made me super excited! I made my own graham crackers and dolce de leche yesterday, planning to bake the cake today. Cheesecake recipes I’ve used so fare, called for placing the cake pan inside a bigger one filled with water, just like you do in your dolce de leche recipe. So I was surprised that you just put it straight in the oven, but I went with the recipe, after all yours always worked well for me and I love them and use them a lot. Well, now the cake is sitting on a rack cooling, and I just noticed that the surface cracked :(. It never happened to my cheesecakes before… I ran a knife around the cake after taking it out of the oven, and it’s not not too cold in my house… I am wondering, does the cracking have anything to do with the baking method? Or what else could have caused it? Usually cracking in the top of a cheesecake is the result of over-baking. You might want to check the temperature of your oven with a thermometer. I usually keep an eye on cheesecake pretty closely; while the baking time listed was spot-on for me, with my oven, they can vary. Dulce de leche is one of those gourmet flavors that you never think of until you get the chance to eat it. And it’s always amazing!